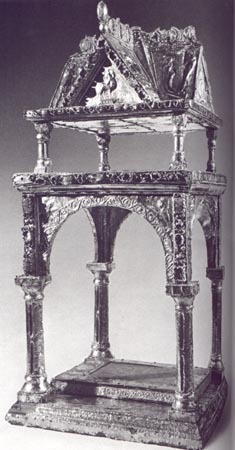 Ciborium of King Arnulf. Munich, Schatzkammer der Residenz. Despite a few minor differences in the style of the reliefs, the ciborium of King Arnulf in Munich is very closely related to the second Lindau cover and still more to the St. Emmeram Gospels. The ciborium and the Gospels have the same history. On the base of the form is an inscription naming King Arnulf as the donor. On the four tympana are the Hand of God, the Lamb, the Angel, and the Globe; on the sloping sides of the roof, scenes from the New Testament: the Temptation of Christ, the raising of Lazarus, the parable of the lilies of the field , the calling of Peter, and the resurrection of the young man of Nain.